In contrast with the three preceding Members of Parliament featured in our blog series, who died in France during the Battle of Loos in September and October 1915, the death of William Lionel Charles Walrond, Conservative MP for Tiverton, took place on home soil. Walrond died on 2 November 1915 at Glen Tana, a Scottish estate owned by his wife’s family. A lieutenant in the Army Service Corps, he had been on extended sick leave since August 1915, when he was sent home from France suffering from acute laryngitis and pulmonary tuberculosis. Walrond, known as Lionel to distinguish from his father, was the third generation of his family to represent the Tiverton constituency. The Walrond family had long held estates at Bradfield, near Cullompton in Devon. His grandfather, John Walrond (1818-89), was Conservative MP for Tiverton, 1865-68, and was created a baronet in 1874. His father, William Hood Walrond (1849-1925), sat as Conservative MP for East Devon, 1880-85, and then for the Tiverton division from 1885 until he was created Baron Waleran in December 1905. Born in 1876, Walrond was the second son, but became the heir to his father’s estates and baronetcy when his older brother John died at San Remo from lung problems in December 1902. Sir William Walrond served as Chief Whip for the Conservative party from 1895 until 1902, and Lionel was appointed as one of his private secretaries in January 1901. He then became private secretary to his father’s successor as Chief Whip, Sir Alexander Acland-Hood. He therefore had extensive knowledge of the workings of party politics before he entered Parliament as his father’s successor at Tiverton at the 1906 election. He was re-elected at the general elections of January and December 1910, despite having lost some popularity in his constituency by voting against the third reading of the old age pensions bill. His wife Lottie was described by one local newspaper as ‘the finest electioneering agent he could ever have obtained’, not only giving speeches, but also singing to the electors. She stood in for him at political meetings when he was in poor health during the January 1910 election, and again after he was in a car accident in January 1912. 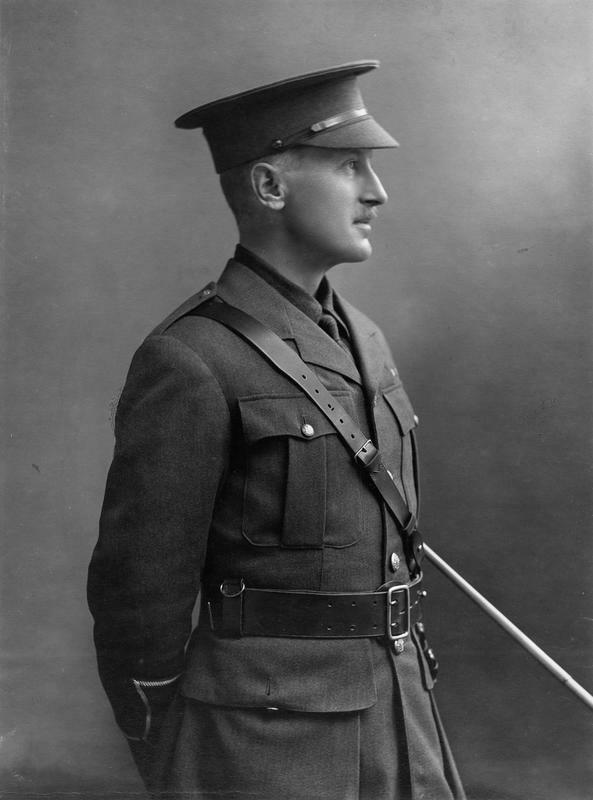 Despite not having a ‘robust constitution’, Walrond volunteered for war service, and was commissioned as a lieutenant in the Army Service Corps. Sent to France, he was placed in the train service, where his work involved loading trains with supplies to be sent to a railhead close to the front, and taking his turn in accompanying trains on their five day journey to the railhead. On 16 December 1914, he recorded that he had to check ‘28 trucks of groceries, hay, oats, sundries, sugar, tea, salt, mustard, pepper, candles, rum, cigarettes, tobacco, charcoal, and odds and ends’. He also had to find space for the Christmas boxes which were arriving for the troops. Although the railhead was situated several miles from the firing line, Walrond told his constituents in April 1915, when he was home on sick leave, that he was ‘still sufficiently near to appreciate the fighting qualities of the British soldier and the full meaning of what is going on’. He lamented that transporting 19- and 20-year-olds to the front ‘seemed to him like taking babes to the slaughter’, and wrote poignantly of the ‘truck-load of kit, rifles, bayonets, harness, sacks’ which ‘told its own tale of the owners who will never want them any more in this world’. Nor was the railway service immune from the dangers of war: Walrond recorded a Zeppelin bomb attack on the railhead which killed sixteen men. His life was far removed from his previous experiences as an MP: in one letter home to his constituency agent, he reflected that ‘I often think how people would shriek with mirth to see me eating my lonely meal in a railway carriage – cold meat, biscuits, jam, sardines and cheese all off one plate, one knife, and my palatial dining-room lit by one candle’. After being at home on sick leave with acute laryngitis from February to May 1915, Walrond returned to France, but declining health forced him home again in August, and he never recovered. Unlike most of the previous MPs we have featured, he was therefore able to be buried in his own parish church at Bradfield in November 1915. He is also commemorated on the war memorial at Uffculme. He was survived by his two young sons (one of whom succeeded as Lord Waleran in 1925), and by his wife, who ran Bradfield Hall as a convalescent home for soldiers during the war, acting as its matron. On transport and supply during the First World War, see this from the Imperial War Museum and this from the British Library. This entry was posted in 20th century history, military history, social history, World War I MPs and tagged Army Service Corps, Lionel Walrond MP, MPs in World War I, Tiverton. Bookmark the permalink.